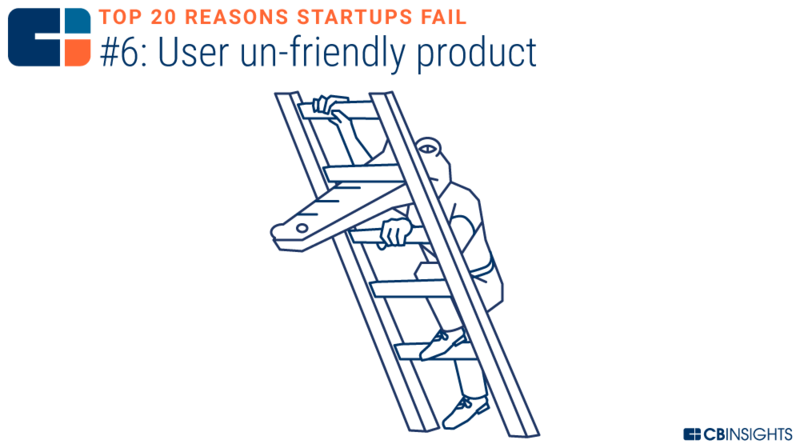 From lack of product-market fit to disharmony on the team, we break down the top 20 reasons for startup failure by analyzing 101 startup failure post-mortems. 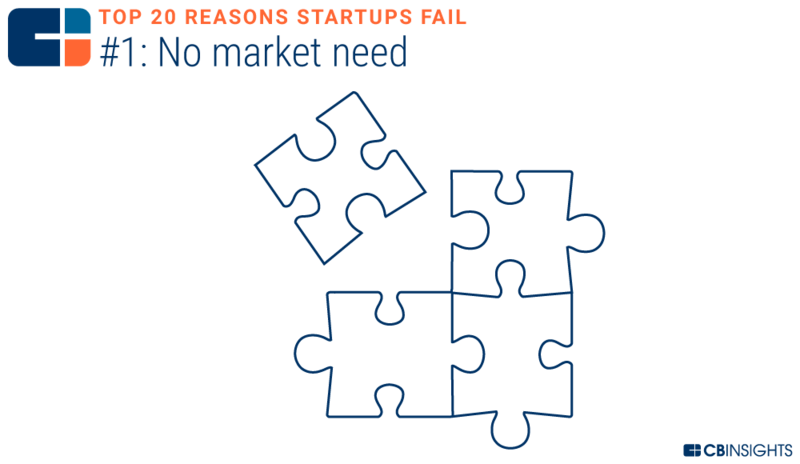 After we compiled our list of startup failure post-mortems, one of the most frequent requests we got was to use these posts to figure out the main reasons startups failed. So we gave those post-mortems the CB Insights’ data treatment to see if we could answer this question. After reading through every single of the 101 postmortems, we’ve learned there is rarely one reason for a single startup’s failure. However, we did begin to see a pattern to these stories. 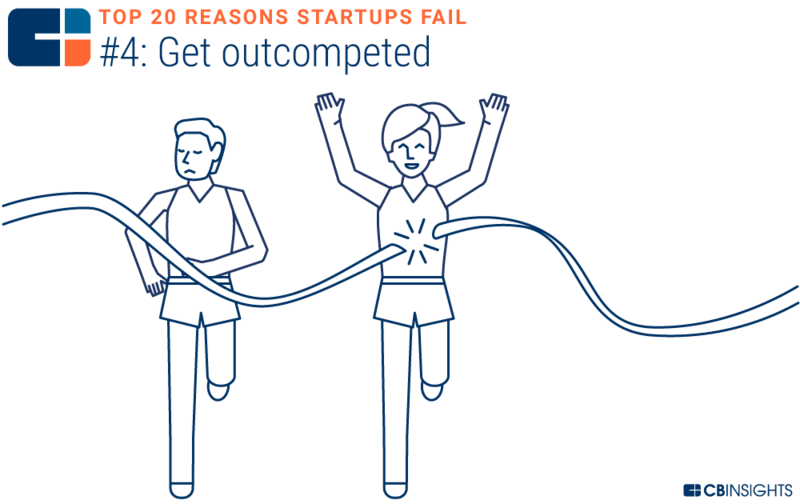 And so after sifting through the post-mortems, we identified the top 20 reasons startups failed. Since many startups offered multiple reasons for their failure, you’ll see the chart highlighting the top 20 reasons doesn’t add up to 100% (it far exceeds it). Following the chart is an explanation of each reason and relevant examples from the postmortems. There is certainly no survivorship bias here. But many very relevant lessons for anyone in the entrepreneurial ecosystem. It’s worth noting that this type of data-driven analysis would not be possible without a number of founders being courageous enough to share stories of their startup’s demise with the world. So a big thank you to them. 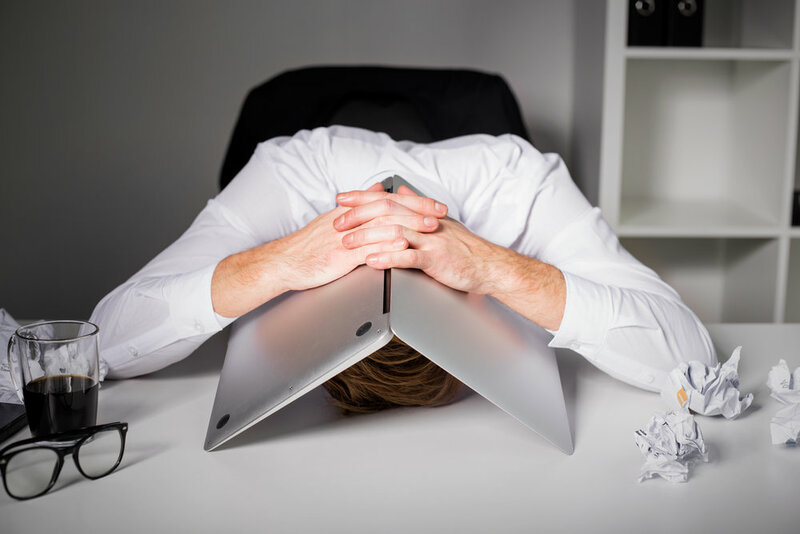 Not pivoting away or quickly enough from a bad product, a bad hire, or a bad decision was cited as a reason for failure in 7% of the post mortems. Dwelling or being married to a bad idea can sap resources and money as well as leave employees frustrated by a lack of progress. Work-life balance is not something that startup founders often get and so the risk of burning out is high. Burn out was given as a reason for failure 8% of the time The ability to cut your losses where necessary and re-direct your efforts when you see a dead end was deemed important to succeeding and avoiding burnout, as was having a solid, diverse, and driven team so that responsibilities can be shared. 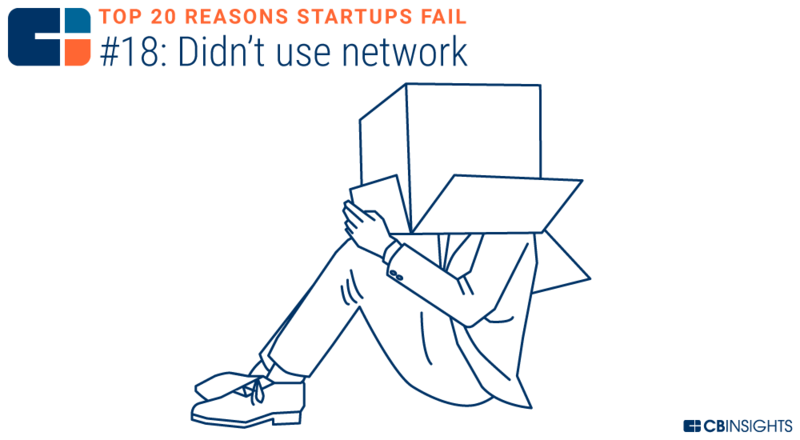 We often hear about startup entrepreneurs lamenting their lack of network or investor connections so we were surprised to see that one of the reasons for failure was entrepreneurs who said they did not properly utilize their own network. Sometimes a startup can evolve from a simple idea to a world of legal complexities that can prove to be a core cause of shutting down. A couple of music startup post-mortems also associated the high costs of dealing with record labels and legal headaches as a reason for startup failure. 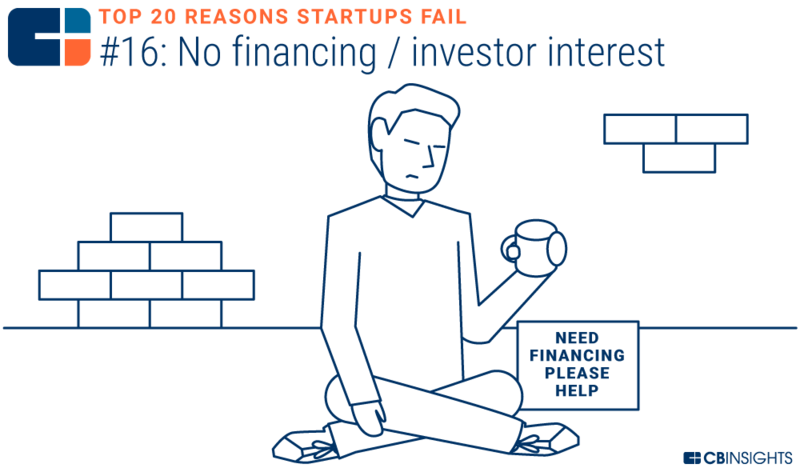 Tying to the more common reason of running out of cash, a number of startup founders explicitly cited a lack of investor interest either at the seed follow-on stage (the Series A Crunch) or at all. Location was an issue in a couple of different ways. The first was that there has to be congruence between your startup’s concept and location. Location also played a role in failure for remote teams. The key being that if your team is working remotely, make sure you find effective communication methods, otherwise lack of teamwork and planning could lead to failure. There are many good ideas out there in the world, but 9% of startup post-mortem founders found that a lack of passion for a domain and a lack of knowledge of a domain were key reasons for failure no matter how good an idea is. Pivots like Burbn to Instagram or ThePoint to Groupon can go extraordinarily well. Or they can start you down the wrong road. Discord with a cofounder was a fatal issue for startup post-mortem companies. But acrimony isn’t limited to the founding team, and when things go bad with an investor, it can get ugly pretty quickly as evidenced in the case of ArsDigital. Getting sidetracked by distracting projects, personal issues, and/or general loss of focus was mentioned in 13% of stories as a contributor to failure. If you release your product too early, users may write it off as not good enough and getting them back may be difficult if their first impression of you is negative. And if you release your product too late, you may have missed your window of opportunity in the market. Ignoring users is a tried and true way to fail. Tunnel vision and not gathering user feedback are fatal flaws for most startups. Knowing your target audience and knowing how to get their attention and convert them to leads and ultimately customers is one of the most important skills of a successful business. But an inability to market was a common failure especially among founders who liked to code or build product but who didn’t relish the idea of promoting the product. Failed founders seem to agree that a business model is important – staying wedded to a single channel or failing to find ways to make money at scale left investors hesitant and founders unable to capitalize on any traction gained. Bad things happen when you ignore what a users wants and need, whether consciously or accidentally. Pricing is a dark art when it comes to startup success, and startup post-mortems highlight the difficulty in pricing a product high enough to eventually cover costs but low enough to bring in customers. Despite the platitudes that startups shouldn’t pay attention to the competition, the reality is that once an idea gets hot or gets market validation, there may be many entrants in a space. And while obsessing over the competition is not healthy, ignoring them was also a recipe for failure in 19% of the startup failures. Money and time are finite and need to be allocated judiciously. The question of how should you spend your money was a frequent conundrum and reason for failure cited by startups (29%). Tackling problems that are interesting to solve rather than those that serve a market need was cited as the No. 1 reason for failure, noted in 42% of cases.